It’s the very last day of my Weight Loss Journal! Wow! Thank you so much for taking this journey with me! With a total weight loss on the 11/12 pound cusp, I”m thrilled with my progress. It has been a super busy time with lots of events and distractions pulling on my focus and resolve, but the Z.E.N. Foods program really seems to have retrained some of my less desirable habits right out of me! Little things that had crept into my routine without my noticing. I’m quick to credit you for playing a significant roll in this, too! I’m not sure if it would have been this easy for ME to hang on to my results, if I didn’t feel a commitment to you. Maybe it’s human nature, maybe it’s just me, I don’t know. I just know, this worked out really well for me and I am eager to call on Z.E.N. (and you) if I ever need a tune up! Wonder why I’m wearing the same top for the third day in a row? It’s the only thing we have with the scent of our new puppy’s little mate, so I’m wearing it to help ease his transition into our home. So far, he’s been amazing. sleeping in his crate overnight, no crying or barking, using the great outdoors for doing his business and forging relationships with our one year old kitties. I think we are all going to be all right! Oh the Tajin! It takes me right back to that magical day when dolphins played with us off the shore of Huatulco, Mexico. I wore a hot pink bikini and a white tee shirt as we snorkeled and swam in the warm ocean waters. Once back aboard the boat, before I even realized I was hungry, someone offered us thinly sliced cucumbers squirted with fresh lime and sprinkled with Tajin. It couldn’t have been a more perfect day! So happy to see you again, my dear Tajin! So we adopted the tiniest little puppy (he’ll be 8 weeks old in a couple of days) from the Best Friends shelter in Mission Hills, California. They have a No Kill policy and are striving to make all of Los Angeles No Kill as well. When they rescue an animal, they commit to the animal for life. We had a fantastic experience there! Special thanks to Heather who introduced us to the puppies! We were hoping to adopt one of about 10 breeds that get along well with cats. I was thinking an animal about a year old would be a good addition to the family, but my daughter really wanted a puppy. Fortunately, my husband was flexible! We all fell in love with a tiny King Charles Cavalier Spaniel (great with cats) / Jack Russell Terrier (not so much) mix. I’m currently more focused on what the dog eats than my own food. That may be a good thing! So we’ve decided to add a dog to the family. I’ve heard it said that people with pets enjoy better health. My thinking is that a couple of walks a day never hurt anyone. At least some of the dog walking will fall to me and consistent walks are something that I enjoy. Here we go. We have agreed in advance not to adopt a dog just to adopt a dog. It has to be the right pet for the whole family. We have our cats to consider, too. We’ve done a little breed research and have identified the top ten breeds that are most likely to cohabitate peacefully with felines. Wish me luck! Here we go! It’s Sunday, and we are headed to the Farmer’s Market. This is the perfect time to start a Rum Pot. I’ve been talking about it for years, but never shared the process on EncinoMom until now. Last year, I never got around to making it, and it was missed during the holidays. Add this to your family traditions for a special treat on Thanksgiving, Christmas or New Year’s Eve. The flavors of Summer sunlight illuminate Winter nights through the fruit. Choose stone fruits for best results. Omit pineapple, citrus and melons. I’ve been warned off of Blueberries and berries with hulls, so I haven’t tried those myself. Cherries, apricots, peaches, plums & nectarines have all worked perfectly for me in the past. Stay away from apples and bananas, too. Pears work well, but I don’t have first hand experience to report. Have fun! Let me know how your Rum Pot turns out. Pitting Cherries in preparation for my Rum Pot. Today, I’m talking about choosing fresh produce in anticipation of tomorrow’s trip to the Farmer’s Market. I don’t know about you, but I find it very frustrating to cut into a beautiful melon or pineapple and discovering a serious lack of flavor. Here’s hoping for better results, tomorrow! Summer fruits from the Farmer’s Market are perfect for making a Rum Pot. Grilled Cantaloupe served here with steamed clams. Click for recipe. Today, I’m sharing another tool that I’m using to create variety, excitement and flavor in my made-at-home, make-ahead meals. At EncinoMom.com, we received a gift box full of glazes, rubs and spices from Urban Accents for an episode of EncinoMom Unboxed. While we opened it on camera, we didn’t have a chance to sample the spices – until now. Well, now that we’ve had the opportunity to try everything, I’m overjoyed to report this assortment of spices has been a life saver! With family coming into town, 4th of July BBQ’s and entertaining at home, maintaining my Z.E.N Foods weight loss was very much on my mind! I used these spices and rubs and seasonings to add variety to my usual food prep ideas. This has expanded my horizons, kept my taste buds exhilarated (without much effort on my part) and essentially, made me look like an amazing hostess, guest and home chef! See more on our website: https://EncinoMom.com/unboxed-3 & rock your Summer! Curious? You can see all of the flavors in our EncinoMom Unboxed video. Click the photo for the link. Happy Tuesday! Today, I’m working from Universal Studios’ new European area. There’s a little courtyard that feels a lot like Paris. Since I won’t be able to make it to a sidewalk café in my favorite city, today, I’ll supervise kids, sip espresso and run my empire from a shady table here. Breakfast and dinner are planned and prepared in advance, so I only have to sort out lunch. What would you have for lunch if you were holed up at Universal Studios for the day? Would sodas be your down fall? Dippin’ Dots? Looking forward to your advice! 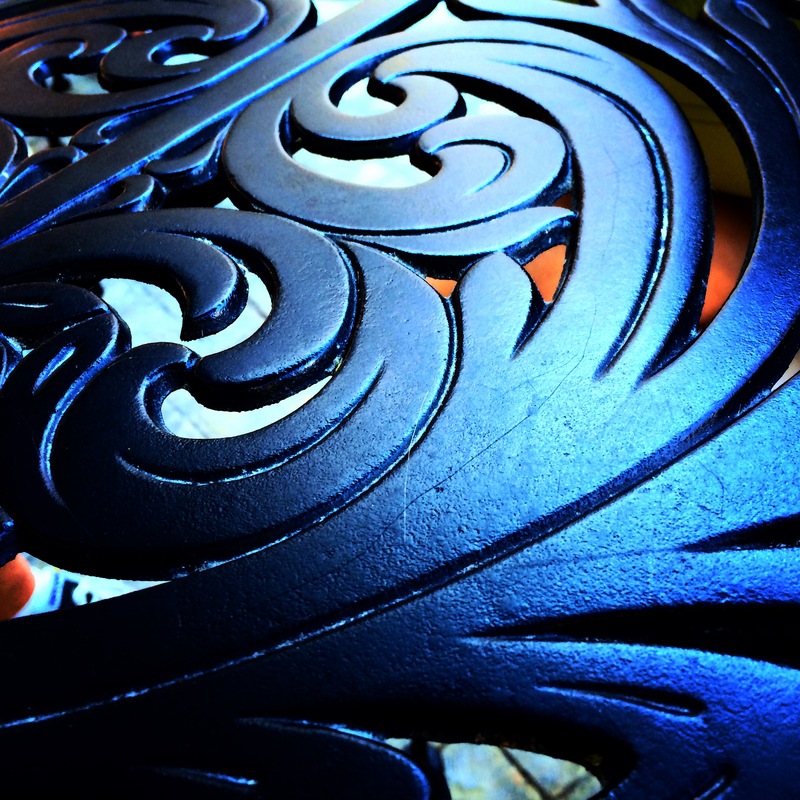 Detail of a tabletop in the French style courtyard at Universal Studios, Hollywood.